(Ben Brumfield CNN) A dog tapping away at a computer keyboard turns to another dog and says, "On the Internet, nobody knows you're a dog." The cartoon by Peter Steiner, which first appeared in The New Yorker in July 1993, perfectly encapsulates the world we live in today. How do you trust someone to be who they say they are on the Internet? 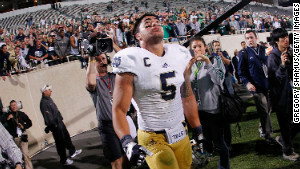 The question has bubbled up again after news broke that Notre Dame linebacker Manti Te'o fell for a "catfish," someone who fakes an identity online to finagle his or her way into a fraudulent romantic relationship. We do our best to avoid being duped. But it's not always easy. "This is so sad, this has happened to me a couple of times in the past when I first started dealing with internet dating," posted Ronnie Williams in a CNN story on the hoax. "I got my heart broken just like this, so trust me, this is a creepy, deceptive low life way of either playing with someones emotions or getting money or information out of them." Twitter offers verified accounts to help us discern public figures from their imitators. Even President Barack Obama in a Reddit chat posted a picture of himself to verify his identity. At CNN, we Skype with eyewitnesses on the scene of breaking news or have them stream live video of themselves and landmarks to verify that they really are where they say they are. At iReport, we call people on the phone to confirm their submissions. Still, people fall for tricks by the droves and some of them have become iconic, if not old and dusty. The classic e-mail scam known as the "Nigerian Letter" or "419" asks for money and your bank data to help out someone who claims to be in a pinch. The person promises to repay your kindness bountifully. Right. Help! A Facebook friend is stuck in a foreign country and needs you to wire him money right away. Or you sell something on Craigslist, and the buyer asks if she can overpay by money order and have you refund the difference in cash. Then the money order turns out to be fake. Online identity scams have multiplied in form and name, phishing via e-mail spread to text messages, prompting the term "SMShing." Vishing is the low-tech version, when someone simply lies to you over the phone ("V" stands for voice) to dupe you into handing over your identity. 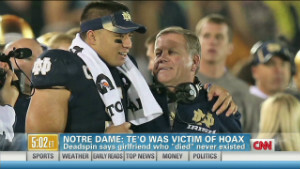 Te'o, for instance, says he was scammed digitally and over the phone . As naive as someone who falls for a fake online girlfriend may seem, it's not hard to do, even for a sports superstar, said Nev Schulman, who hosts the MTV reality show "Catfish." "When you make a connection with someone online, oftentimes it feels a little limited, but also safe," Schulman told MTV News. "Then people open up and get very close without scrutinizing the other person." Still, we take steps. Step one: We Google. Relentlessly. Before a blind date. Before picking up a concert ticket we bought off someone. Before hiring someone to rake our yard. Because on the Internet, we the dog catchers have our work cut out for us. What steps do you take? What are the signs you look for to verify someone's real? 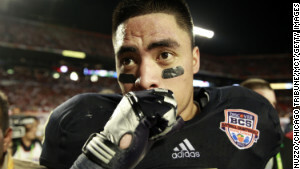 Were you still duped? Let us know in the comments section below.